How to evaluate and rate your Vendors Performance in Excel? Download this Vendor Performance Evaluation Excel worksheet and start immediately with your comparison! We support you and your company by providing this Vendor Performance Evaluation Form template, which will save your time, cost and efforts and help you to increase the results that come out of your purchasing process and vendor relations! This Vendor Rating Comparison in Excel works with a weighting system, and will automatically calculate all the results in Excel. You will see that its intuitive, ready-to-use and logically structured. This blank Excel Vendor Rating system template enables you to compare 3 (or more) suppliers on a list of items for their supply of Commodities or Services. The scale goes from Excellent (4), Good (3), Fair (2) to Poor (1) and it has the option to place Comments. 1. Evaluate Vendor on items listed and check the appropriate columns, because some items may not apply. 2. Indicate Vendor’s overall rating by checking the appropriate column. 4. Return to the Office of Purchasing. 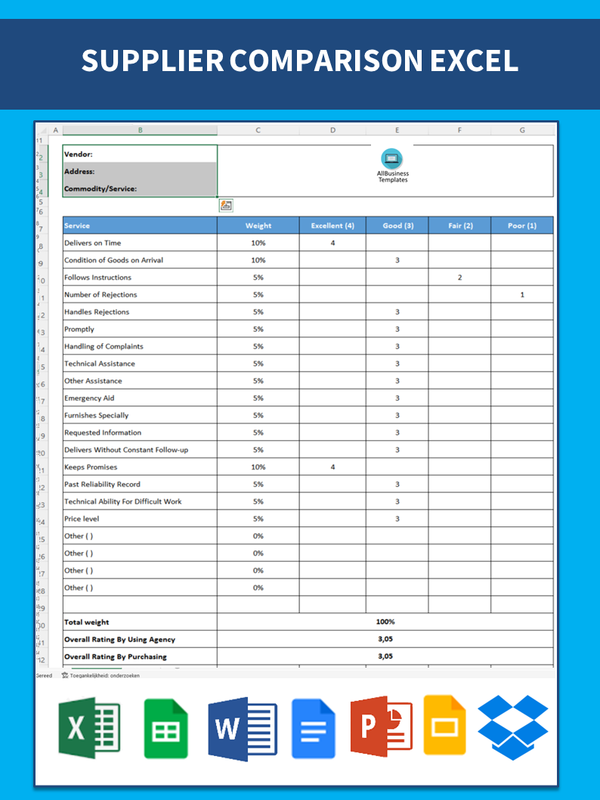 Download this Vendor Rating Excel Sheet With Weighting template now!